Bill Christofferson had worked for a quick-print company starting in 1982. But after eight years of working for someone else, he was ready to be his own boss and he found a small, family-owned printer up for sale in Lansing. But with a wife, young children, and a mortgage, he didn’t have the financial capital to purchase the company on his own. So in a scene that you would only expect in the movies, Bill was out with his dad and his dad’s Yooper buddies enjoying a beer or two at a local watering hole. One of his dad’s friends had heard that Bill was looking at a new venture and he settled into the bar stool next to Bill to learn more about it. Bill gave his dad’s buddy a quick summary of the opportunity, and out came the buddy’s check book. Right there at the bar, a check was written for the purchase price of the business and additional cash to get the business going. And just like that, Bill was about to become the owner of Colonial Press and Copy Shop. Colonial grew each year until 1996, when Bill took on Jeff Donahue as a business partner and purchased Lansing Printing Company, a much larger, and older printer. With a rich history dating back to 1905, Lansing Printing Company afforded Bill and Jeff the opportunity to deliver printed materials on a much larger scope and scale than Bill’s days with Colonial. This purchase really became the moment that Foresight Group was born. Lansing Printing Company grew over that first year, when leadership decided that the mail services that their customers needed could best be provided in-house. So Mailsource was created, a full-service mail services division. The addition of Mailsource taught the leadership team a valuable lesson — customers could teach us a great deal about what they wanted and needed, so we became open to starting new divisions, acquiring other companies that provided similar services, and finding ways to grow the company beyond just increasing sales. 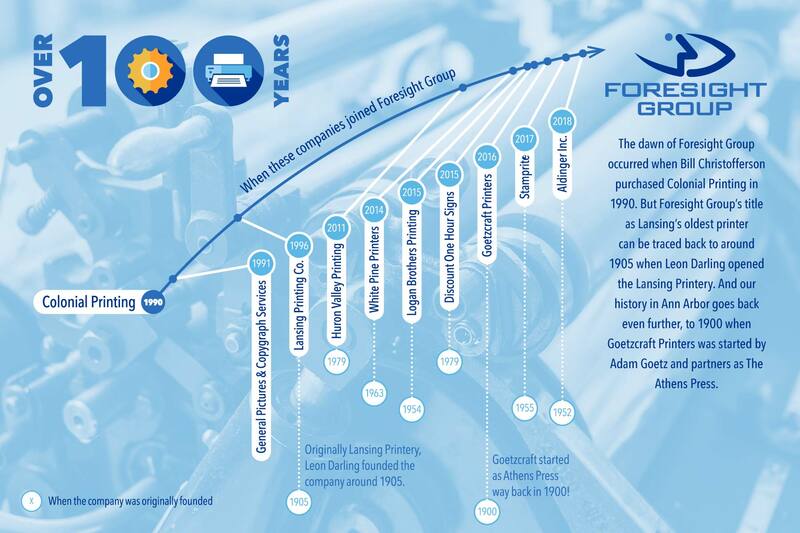 In 1999, the Foresight Group name was officially adopted as a more unified, forward-thinking company that provided commercial printing, mail, and even creative services. This new approach continued until 2005, when Bill and Jeff agreed to a mutually beneficial buy-out. This pushed Bill to become fully entrenched in the financial side of the business, which was not what his role had typically been. But he worked diligently at it and became an expert on the financial side of the business … just in time for the economic downturn that began in 2008. As the printing industry suffered through its largest contraction in history, Foresight Group kept going using a healthy balance of traditional off-set printing and by embracing digital technology. We also found a way to dip our toes into the large format and display graphics business in 2010. Our purchase of a large format, roll-fed plotter brought us into the sign and display graphics business, further diversifying our services. This balance had us positioned for growth the moment the economy returned, and return it did! By 2011, we had purchased, renovated and moved into our current headquarters on Martin Luther King, Jr. Boulevard in Lansing. Foresight Group also acquired Huron Valley Printing and Imaging in Ann Arbor, and moved them into the Foresight Group: Ann Arbor facility on Victor’s Way in 2012. This acquisition was a turning point for Foresight Group, as the process of merging an existing print operation — including their staff — became an area of expertise for our leadership. And starting in 2014, we would acquire and integrate at least one company per year through 2018! Over the next few years, White Pine Printers, Logan Brothers Printing Company, Goetzcraft Printers, and Aldinger Inc. were all acquired and integrated into our Lansing and Ann Arbor locations. These acquisitions grew us into the largest printer in Mid-Michigan but more importantly they added incredible, thoughtful staff members to the Foresight Group team. These new team members became part of the fabric that makes Foresight Group what it is today, and we couldn’t be prouder of the team they have become. Our sign and display graphics services that we had started in 2010 nearly doubled in size when we purchased Discount One Hour Signs in 2015. This commitment to sign-making and display graphics also positioned us to purchase Stamprite in 2017, and in 2019, both Stamprite and Discount One Hour Signs will be fully integrated into Foresight SuperSign. The new SuperSign headquarters on Marquette Street, across from the Foresight Group headquarters (the Print & Mail building), will be our single location for all sign and display graphics sales and production moving forward. So as Foresight Group continues to grow and evolve, we would like to take a moment to reflect on all of the great companies that led to what we are today. The following is a list of companies that are now part of Foresight Group. 1991 - The employees from General Pictures and Copygraph Services joined Colonial Printing as their business began to crumble. Some of their staff are still working for Foresight Group today! 1996 - Bill Christofferson and Jeff Donahue purchased Lansing Printing Company, with roots dating back to 1905. 1997 - Mailsource was started. It continues today as Foresight Group’s mail services division. 2011 - Huron Valley Printing Company is purchased. 2014 - White Pine Printers is purchased. 2015 - Logan Brothers Printing Company and Discount One Hour Signs are purchased. 2016 - Goetzcraft Printers is purchased, with roots dating back to 1900! 2017 - Stamprite is purchased. 2018 - Aldinger, Inc. is purchased.